Welcome! Sit back and relax as the splash screen displays and Extract Fax Numbers loads. 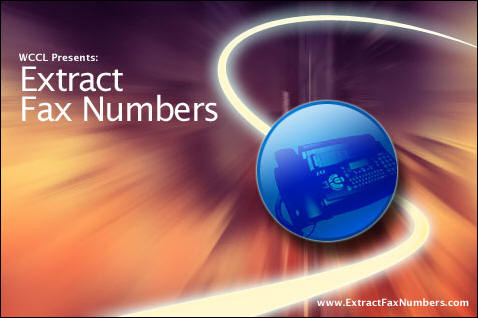 MAIN SCREEN: Getting started with Extract Fax Numbers is easy! 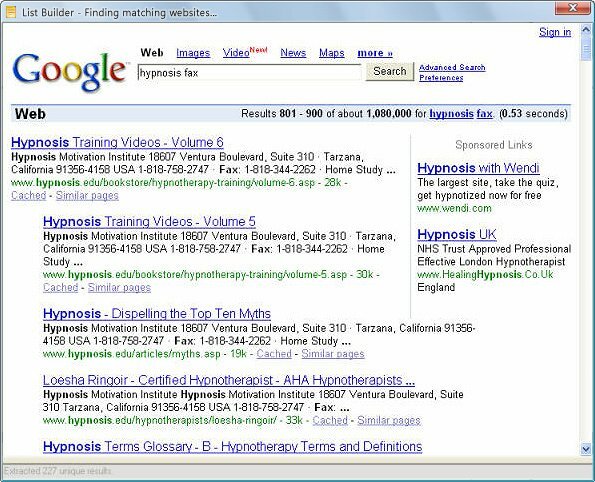 Enter search keywords that will likely bring up the fax numbers you're looking to identify. 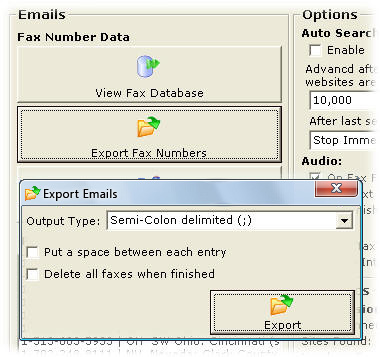 Then click the "Start" button to have Extract Fax Numbers begin searching the Internet, extracting all the right fax numbers for you. WATCH AS IT SEARCHES: You can literally see Extract Fax Numbers in action! Simply sit back and relax as you watch Extract Fax Numbers scan through thousands of Web sites, searching for the right fax numbers for you. FAX YOUR MESSAGE TO THE WORLD: Ready for marketing heaven? When you're ready to blast your message to the world, simply launch the Fax Sender program. Just enter your marketing message - and copy/paste the fax numbers you wish to contact. Then let Fax Sender begin sending the fax messages around the globe - by automating a FREE yet little-known online faxing service! Alternatively, you can export your numbers (see below) - ready for mass faxing using other tools. 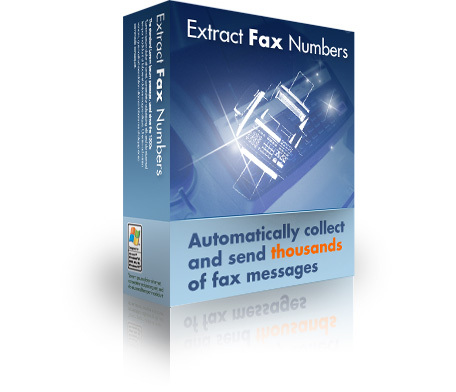 EXPORT YOUR FAX NUMBERS: With Extract Fax Numbers, you're in control! You can export all of the fax numbers you've located in three popular formats, ready for importing and using with any mass faxing tool. It's easy! FULL ACCESS DATABASE SUPPORT: Connect into Extract Fax Numbers from any application! Extract Fax Numbers provides full Microsoft Access database support, meaning you can instantly use it's results with any mass faxing tool - or use it to mail-merge, with programs such as Microsoft Word. It’s hard to believe that Extract Fax Numbers costs less than the price of a decent lunch. And yet you can get ALL of this exciting functionality… for JUST $19.95! That one tiny price covers everything. You’ll receive the Extract Fax Numbers software, our exclusive Fax Sender software, lifetime support and 100% FREE lifetime upgrades. It’s EVERYTHING you need to find fax numbers and SEND fax messages across the globe – 100% FREE of charge – for LIFE! PLUS! If you order by midnight, Wednesday, January 30th 2019, we’ll give you a FREE COPY of the ultimate Web site design tool, Serif WebPlus SE – plus a MASS of FREE Web templates as an added bonus. Still unsure? 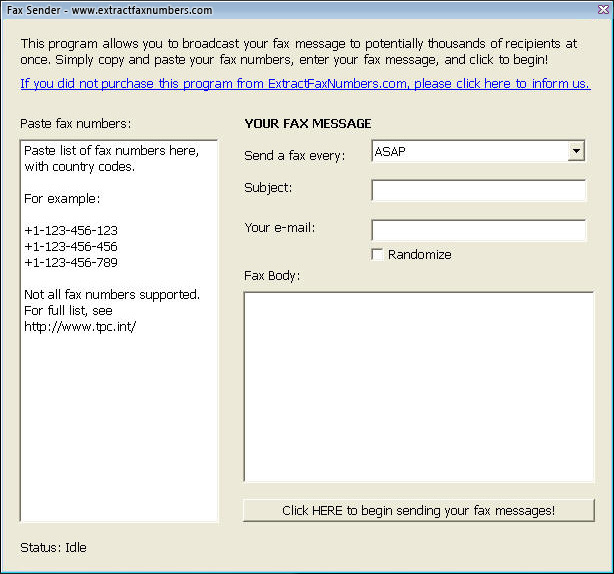 Click here to see screenshots of Extract Fax Numbers in action!